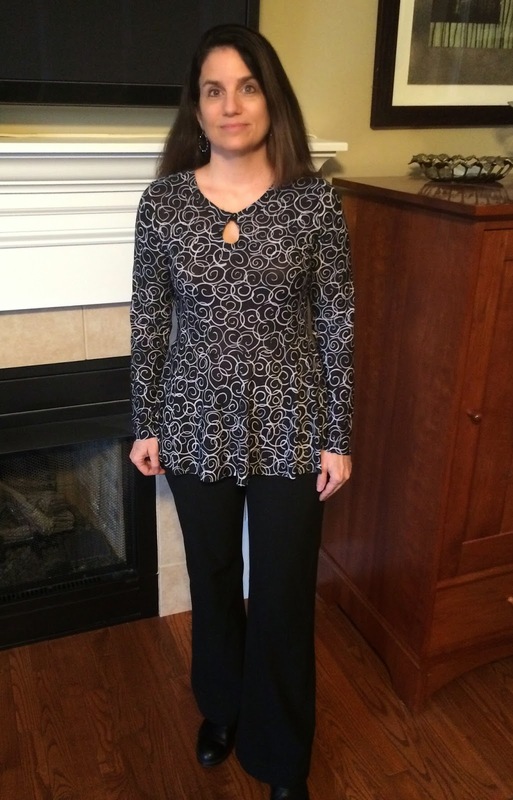 Fabric Mart Fabricistas: Pretty Peplum Tops Revealed!! Wow! 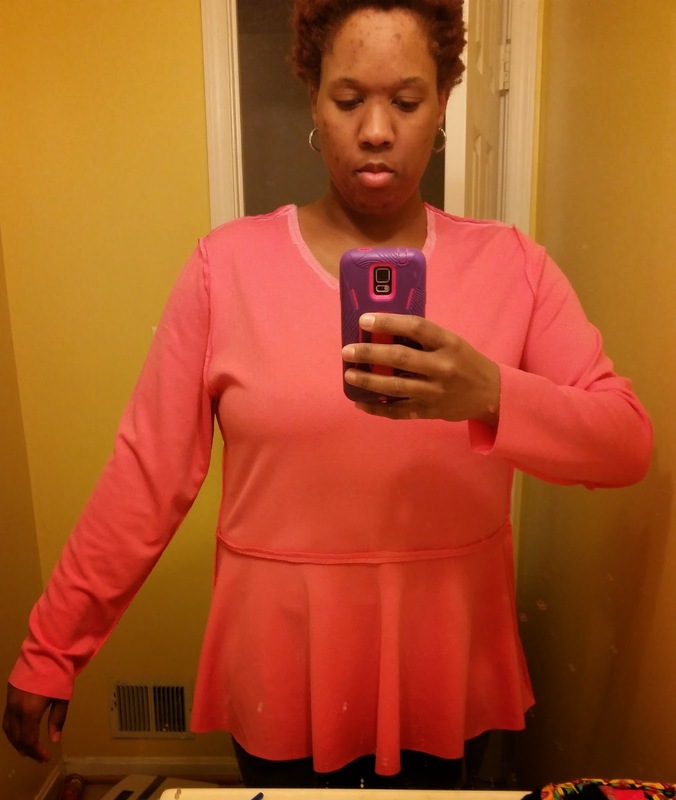 I'm so happy with the number of people that participated in the Pretty Peplum Top Sew Along! From the sound of it, it was fun for everyone and you all learned something! After reading the comments, it was interesting to see how much the pattern had to be brought in. I think that is the beauty of Pamela's Patterns--- she leaves a little extra space because everyone's bodies are different. So by trying it on as you go, you can take the extra out of it and still have a nice fitting garment in the end. Thank you to everyone that participated in the sew along! Also a BIG thank you goes out to Pamela from Pamela's Patterns! 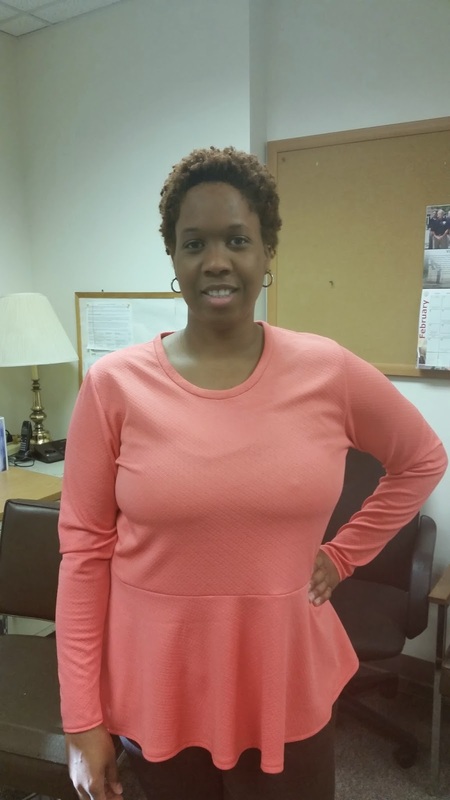 She not only created the Pretty Peplum top, but she also answered your questions! As you know, participants that submitted a photo by March 5, were entered into a drawing. One randomly selected person will win a $100 gift certificate to Fabric Mart AND a $30 gift certificate to Pamela's Patterns! And without further ado...let's reveal the winner of our random drawing! Thank you so much for participating and great job on your top! We will be in touch with you very soon! 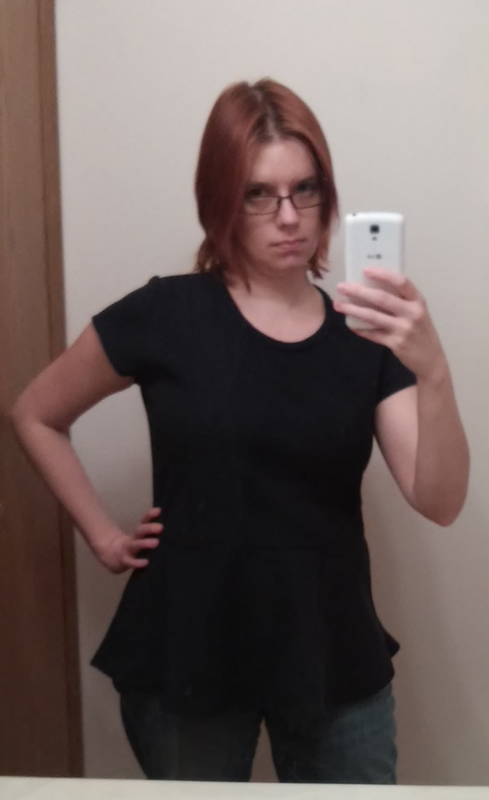 I wasn't sure if this peplum style would be flattering on me. However, I love Pamela's Patterns and decided to give it a try! 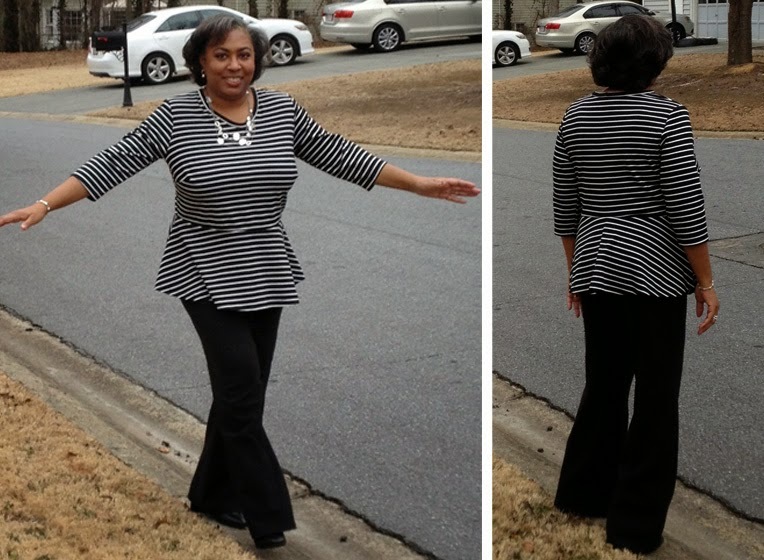 I used a black and white stripe ponte knit from Fabric Mart. Since I made a tank from the #108 The New Versatile Twin Set, I decided I needed 1" more full bust adjustment (FBA). I so appreciate the darted pattern pieces which Ms. Leggett provides...it makes fitting so easy. Once I tried the top on I took in 1/2" on the sides of the bodice. I also enjoyed the neckline binding method that we used and am pretty happy with how it turned out. I bought the fabric a couple of summers ago. If I remember correctly, it's a rayon knit, super soft, but rather a pain to work with. I ended up using my walking foot because it was so stretchy. This is a small with a dart. I still have some gather at the armscye, so I guess I'll have to shorten the sleeve cap. I should bring up the waist a bit, too. I didn't want to baste and fit with this fabric, it was difficult to rip out. I figured that this was more of a muslin, but a wearable one. If I use a less stretchy fabric I may have to do a FBA, my high/full bust difference is ~6 inches. It really helped reading your posts, others' comments, and Pamela's website. Using the stabilizer has been a revelation! I want a "do over" for all the knits I've made up until now. 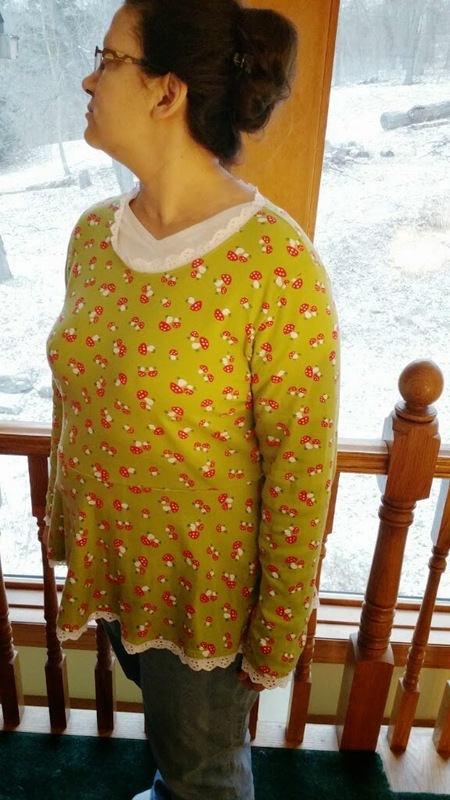 I decided to make my version of Pamela's Pretty Peplum Top out of a Jade Green Washable Wool Blend fabric that I purchased from Fabric Mart. 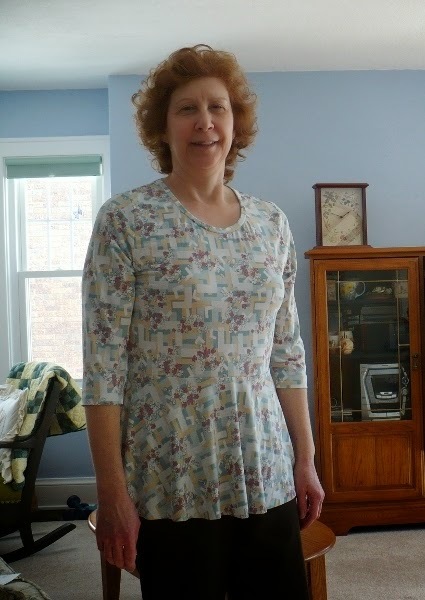 I prewashed the fabric and cut it out using the medium size based on the many shirts I have made with Pamela's other patterns. I then added the SewkeysE woven stay tape to the shoulders and the knit stay tape to the neckline, sewed the bust darts, shoulder seams, three-quarter sleeves, and attached the peplums to the front and back. 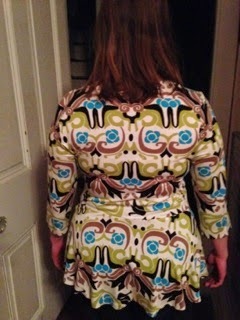 I basted the side seams closed and made a 3/4" adjustment at the hemline and tapered to about a 1/4" at the waist. After the fitting I stitched the sides closed with my serger. Even though knits don't normally ravel, I like to finish my sleeve edges and hem with a 3 thread overlock. I used the double fusible stay tape cut down to 1/2" then used straight pins on my ironing board to help me align the hem for pressing the raw edge up for finishing. Here I used a 2.5 stretch double needle to finish both sleeves and bottom hem. Next time I will also make the bodice 1" longer to bring the peplum down. I think it would look better placed lower on my waist. This was so much fun and the first time ever using an independent pattern. Now I'm venturing into other indies. I purchased the fabric at Fabric Mart and it was very easy to work with. I made the peplum in the back a little longer with a curve at the bottom. It was a fun project and I hope you have more. After basting the top together, I decided to raise the waist 1/2". I also took in the peplum and side seams 3/4" at the bottom of the peplum and gradually tapered it to 0 at the underarm. I also added shoulder pads to the top. I feel the top is a little too large on me. I can probably use a size medium with fabrics that have more stretch and a large with fabrics that have less stretch. The pattern does not offer any guidelines as to how much stretch is best suited to the style of the top. In conclusion, I enjoyed the sew along experience and I learned a few new techniques. I used Fabric Mart ponte knit. I made a medium and had to take in sides and shoulders quite a bit. I also had folds under arms and will cut the dart version next time. This was very fun and hope to do more classes. 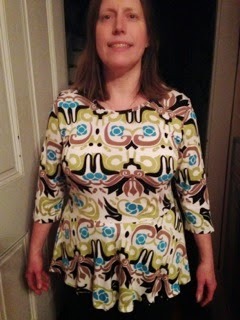 I really enjoyed the sew-along, although this is the first top I have made and I definitely had some missteps. 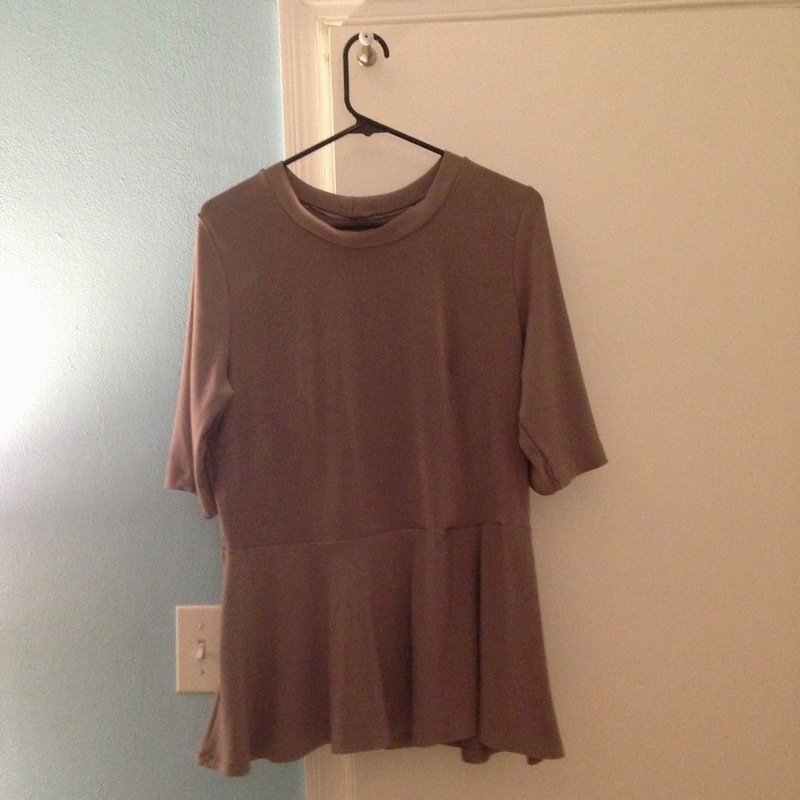 I made a size small with bust darts using a bamboo rayon knit. My only modification was elbow length sleeves, a must for Florida weather :). I can't wait to try this pattern again! I first did the pattern in an ITY knit. I did the small size, but it was way too big. Below is a very unflattering photo! My bobbin ran out of thread on that last sleeve. The next time, I used a ponte knit. 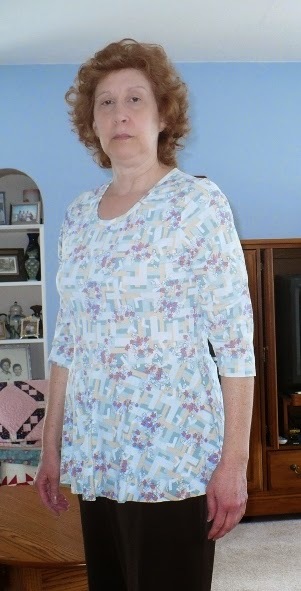 I still used the size small, but this time I shortened the armholes like Pamela showed in her video. I also changed the seam allowance on the sides from 1/4 in to 1/2 in. On the peplum bottom, I took in two inches at each side seam and then tapered that up to the waistline. Finally, I trimmed the hem by 1 and 1/4 inch. I never did put any darts in, but I'll do it next time. The top turned out much better than I thought it would. And, at first I was annoyed about altering the pattern, but I think in the end I learned a lot of valuable tips. 1. 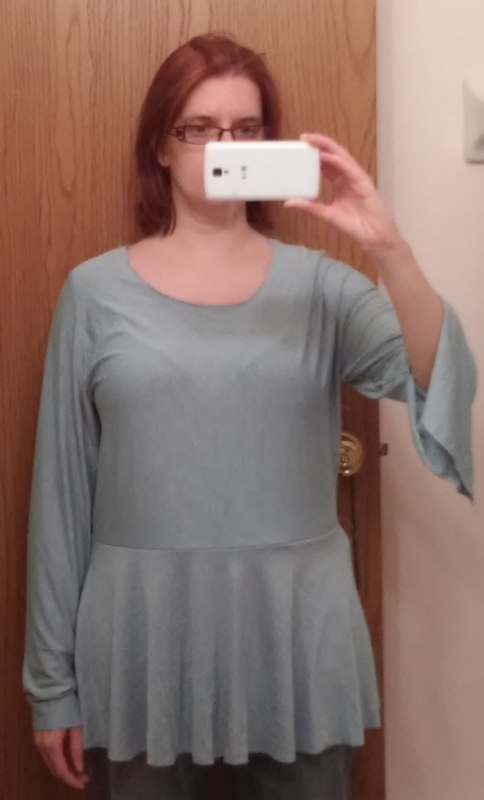 Combined the XL sleeves with the L bodice. I have large upper arms and dislike a tight fit in that area. 2. 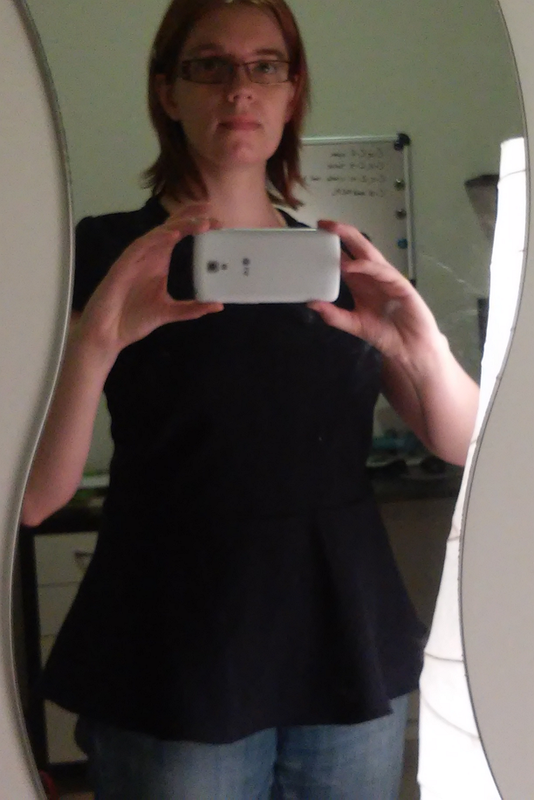 Brought in the waist area (above the peplum line) by about 4 inches. 3. Finished the top with some eyelet trim just 'cause I like eyelet trim. It's a great pattern and I plan on making summer tee shirts with it. I ended up cutting about 1/4" from the left shoulder to make it sit on the shoulders correctly. Until I saw this alteration on the directions, I didn't realize that there was a difference in my shoulders! I removed about 1" from the bottom sides of the peplum, going to nothing at the peplum/bodice seam. I sewed it together then decided I didn't like where the peplum sat so I raised it about 1-1/2"
I used the knit Sewkeyz stay tape on the neck and the EZ steam on the hems. I cut an XS in the undarted bodice from the shoulder to hip and then graded out to a S at the hip. 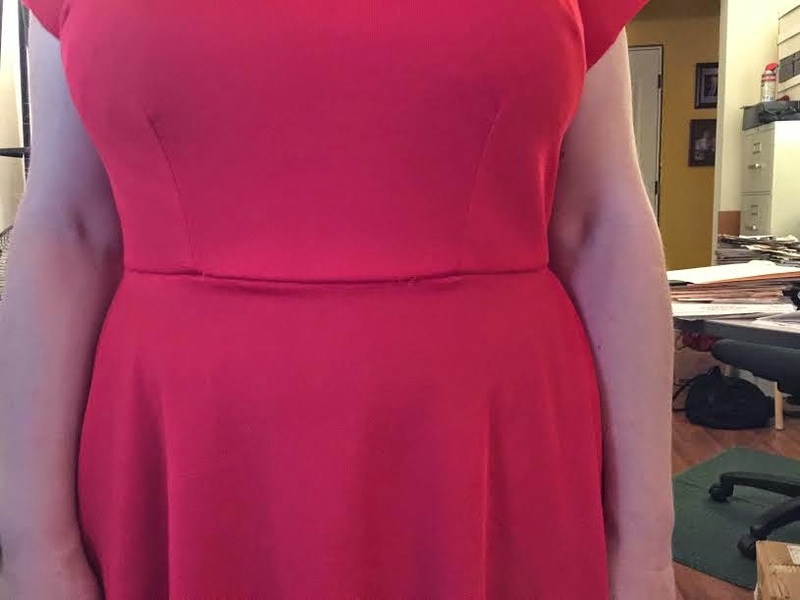 For reference, my full bust is 36", waist is 29" and my upper hip is 38"
I am very glad I baste fit this first, the XS was way too big in the waist - I ended up taking in another entire inch from each side from my underbust to my waist. My fabric was a very stretchy ITY knit. 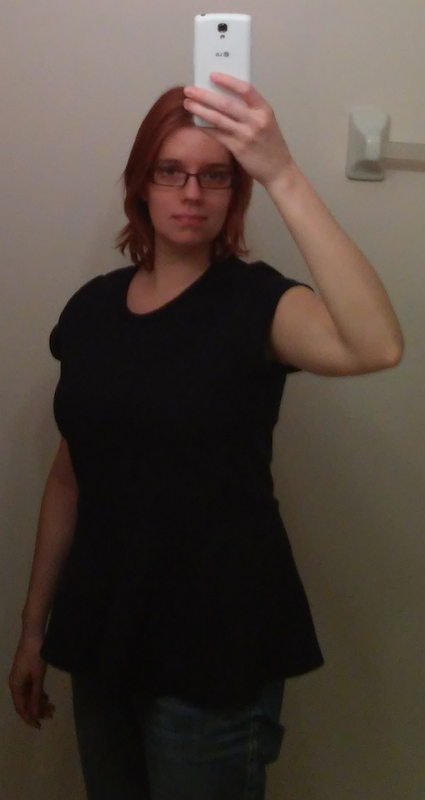 I shortened the armholes and sleeve armscye and then brought them up an additional inch. I also brought the waistline up an inch. I took this in so much in bust, waist and hips! I also raised the waistline about 1'2". My high bust vs regular bust was a difference of 2.5 inches but I am wondering if I should try the darted version, just to compare. Glad for the sew along on this as I probably would not have tried it otherwise! I had a high bust measurement of 43.5, so hesitantly made an extra large. Ended up taking in side seams 5/8" from bottom of sleeve to bottom of peplum. Had added 2" to top pattern as I am 6' tall, but ended up cutting off 1.5" of that, ending up with .5" longer than pattern. I did check the shoulder area after seaming front and back together and it seemed fine, but after everything was done, I went back and sewed the armhole seam deeper - 5/8" notch to notch around side seam graduating out to 1" deep at top of shoulder. That helped a bit, but It still feels somewhat tent like. I used the darted front as I have a 7" difference from high to full bust. I am wondering if I need to do that procedure on the armhole; I can't imagine that with this build that I would have to 'petite' anything, but it seems big all over. The next one will be cut using the large, not extra large, lines probably still adding .5" to it. I think the weight of the knit had a lot to do with the fit. I don't know what to call the knit, it was in my stash for years- a slinky purple with understated silver metallic sparkles in it. I didn't realize how heavy it might be considered until I found it IMPOSSIBLE to do a small self cover button for the keyhole neck. I am thinking a ponte for the next one. I am greatful for the opportunity to participate in this project as it improved my very limited skills at working with knits and gave me some great tools to continue on that path (seriously, I LOVE that SewkeysE stuff and now I have 25ish yards of the 3 different tapes that I have to use up!). Thank you for running this event and I am looking forward to seeing other people's stuff and hearing about their experiences. Well, I was able to get something finished that doesn't look to bad. I'm still not happy with it but I have taken it apart and played with it until I'm quite frustrated. 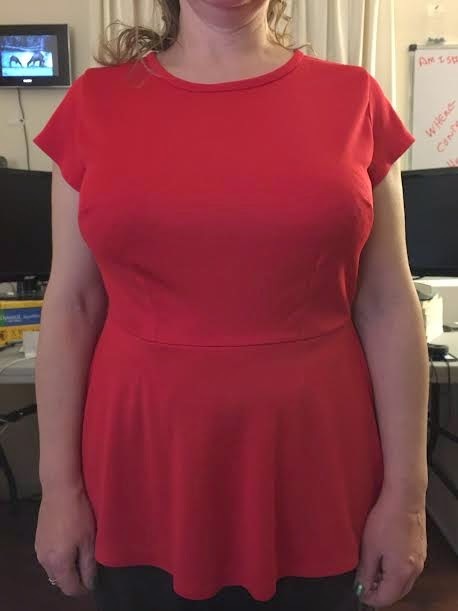 Based on my measurements I made a small, with the darted front (I was right at 3 inch of difference between my high and full bust measurement) and a jewel neckline. My fabric was a light weight red knit from my stash, not sure what type, but it is quite stretchy. I found that I needed to add darts at the waistline, everything else I tried, looked like I was wearing a tent. I had a lot of problems fitting tops because of my large bust-line, so the fit problems are normal for me. I would really love it, if I could find someone that I could take classes from or get some one-on-one instruction. Anyway, I don't sew knits a lot and have had mixed results with my attempts. 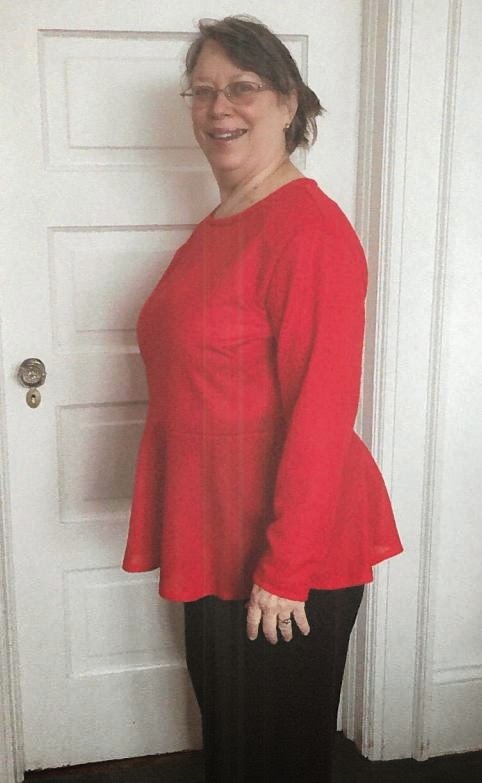 The one thing that I really liked about this, was the use of and instruction on stay tape, this was new for me and I really like the way the neckline and hems turned out. Following is a list of the changes that I did make. Removed 5/8" from the upper sleeve, and arm hole shorten/lengthen area of both front and back bodice. Narrowed the shoulder, 1/2" at the top of the shoulder. Narrowed the back by removing 3/4" at the waist and 3/8" at the arm hole. Narrowed the back peplum 3/4" at the waist and 2" at the hem. The waist needed to them be tapered from center front to the dart started at 1/4". Also from side seam to dart starting at 1/2". Narrowed the front peplum 1-1/4" at the waist and 3-1/4" at the hem. 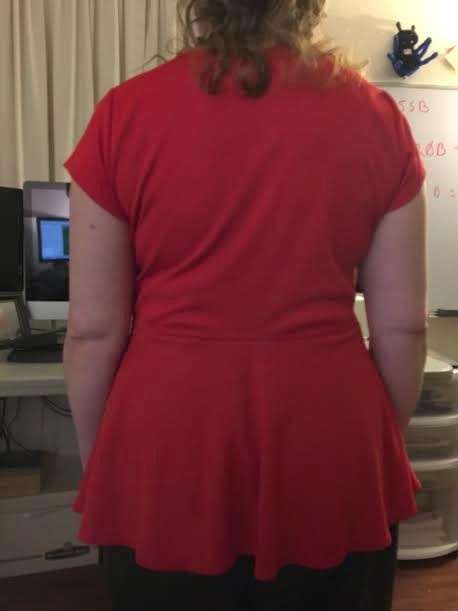 The back waist needs to be raised a little more not sure how much, but based on the back picture it still looks a little long to me. The front needs to be lengthen at the waist, maybe not remove the 1/2" (I removed prior to my first cut) and see were things are. I think the darts at the waistline may need to be just a slight bit larger, and maybe not take quite so much from the back side seams. I would like to try this with a heavier knit and see if maybe that doesn't help the fit. I enjoyed following along and attached pics of my top. I had a few issues, especially with the 1/4 seam allowance. I used a light weight drapy knit which scootched around terribly. The narrow seam allowance made it difficult to control. I should have used a walking foot as the upper layer grew stitching every seam. I have not hemmed the flounce yet. I'm not sure how long I want the top or how long it should be. I moved the shoulder forward, a standard change for me. I did not lengthen the bodice (normally I have to add 1-1/2 inches to every pattern) since most reviews I read said they needed to shorten the bodice length. Overall my result is okay, but I'm not "in love" with my top. I will make another in a beefier fabric and see how that one turns out. Congratulations to Nadalynn! Everyone did such a great job with this sew along. It's great to see the pattern made up in such a wide variety of fabrics. Wow! I can't believe it! I excitedly got online to see everyone else's tops and the fabrics that were used. I didn't expect to see my name! It's obvious we all enjoyed the sew along and learned a thing or two. Thank you Fabric Mart and Pamela's Patterns...this has made my week! Congrats Nadalynn! I love your top! I hope you get a lot of wear (and compliments) of your beautiful top! Congrats to all for trying a great pattern and creating a fun and lovely top!